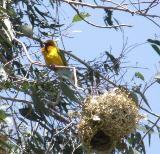 The first two PHOWN records have been submitted for the Loanga Weaver Ploceus subpersonata. They were submitted by Guillaume Passavy, who also published the first details of the nest and young of this species (see news item). These are also the first PHOWN records from Gabon. The author gave the first description of the nests in a paper in Malimbus 33:78-85. Two completed nests had a retort shape, similar to those of Ploceus nigricollis but with a shorter entrance tube. They both had a spherical chamber of c. 10 cm in diameter, with a vertical entrance tube 10 cm long and c. 4-5 cm in diameter. Both nests were made of grass, mainly dry leaves but also some thin and flexible stems. The nests were not tightly woven, and presented a somewhat loose appearance from the outside. The first complete nest was attached to a small White Mangrove Laguncularia racemosa, 1.52 m above water in a 2-m wide drainage ditch (PHOWN record VM 2007). 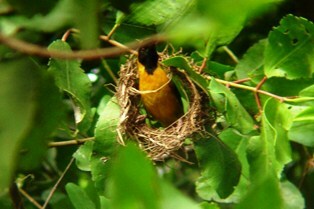 The second nest was also 1.5 m above water, attached to a Eucalptus tree (PHOWN record VM 2008).